Trick Pony exploded right out of the starting gate with their highly acclaimed, platinum selling self-titled CD. Mega-hits co-written by Dean like “Pour Me,” and the Grammy nominated “Just What I Do,” established Ira Dean as a new singer-songwriting force and studio musician in country music. The trio won both the American Music Awards’ “Top New Artist” and the Country Music Association’s “Artist of the Year”. The second CD, On A Mission ,which Ira co-wrote 7 cuts for, including the hit single “ON A MISSION” brought five more Academy of Country Music nominations including “Album of the Year” and “Vocal Group of the Year”. Ira is a mega talentedand proliferate musician and songwriter. He plays 13 instruments and majored in music after receiving a college scholarship, as a drummer! 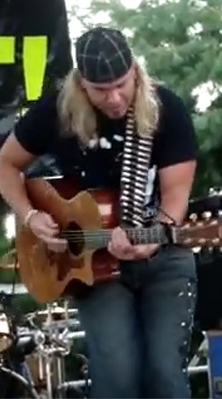 Since the split of Trick Pony, Ira has had his songs recorded by Joe Nichols, Chris Young, ex-pony Heidi Newfield, Jake Owen, and Gary Allan, including his hit single “FEELING LIKE THAT”. Montgomery Gentry has had another Ira hit, with “ONE IN EVERY CROWD , and that’s just to name a few! You can also check out Ira Dean on the video game GOLDEN TEE , Its a wild and rowdy theme song ,with a video that only Ira could deliver. Ira has just finished recording and producing his new solo CD, along with Joe Scaife , Blake Chancey , and Anthony Smith. The album, titled “It’s About Time”, features the song “Nothing to Do ‘Round Here” as well as 13 other tracks that will leave you wanting more. Ira made a second album available titled “Beer or Gasoline”, an 11 track burner that includes his past singles “Somethin’ Bout a Sunday” and “Beer or Gasoline”. Check Ira out at http://iradean.com, and check out his new music on itunes! Ira has worn jeri designs guitar straps since the early years of Trick Pony, and we're currently revamping his collection. 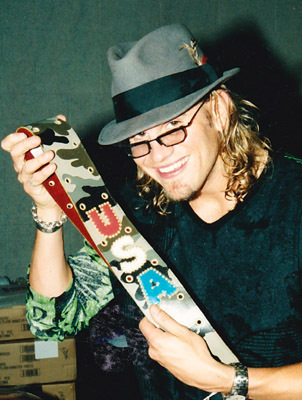 Keep an eye here for the new jeri hart straps Ira will be sporting soon!